Notes on the "Lamprologus" genus name. 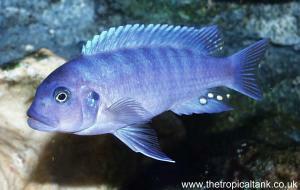 Many of the Tanganyikan cichlids originally described as Lamprologus have now been split into other groups such as Neolamprologus, Altolamprologus and Lepidiolamprologus. 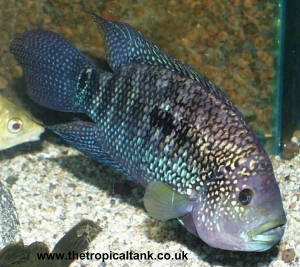 A number of small Tanganyikan cichlids have been retained in the genus Lamprologus, but this is now considered only a temporary placement. It is now thought that there are no Lamprologus species in Lake Tanganyika, and that all true Lamprologus, such as Lamprologus congoensis, are riverine species. The prescence of a particular bone structure in the lower jaw (which is cartilage in other cichlids) has been used as a major character to distinguish genera which belong to a group defined as the "ossified group". 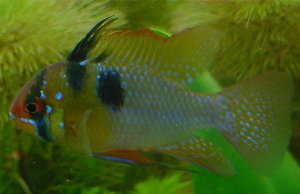 This includes the genera Altolamprologus, Lepidiolamprologus and Lamprologus. The species currently assigned temporarily to Lamprologus include: brevis, callipterus, calliurus, caudopunctatus, finalimas, leloupi (not leleupi! 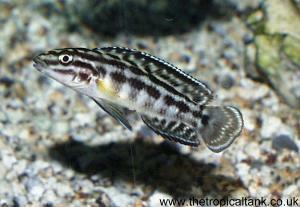 ), multifasciatus, ocellatus, ornatipinnis, similis, speciosus, stappersi (meleagris) and wauthioni.